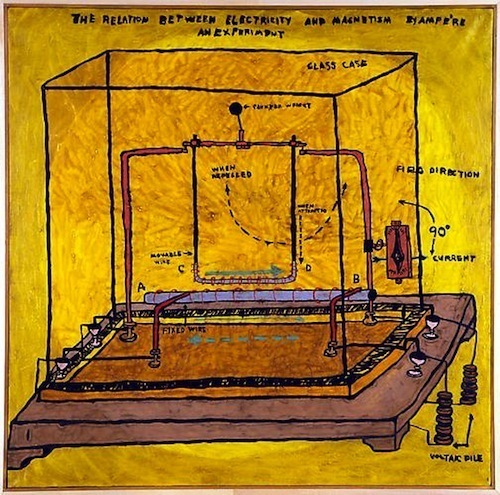 Paul Laffoley, RELATION BETWEEN ELECTRICITY AND MAGNETISM BY AMPÈRE: AN EXPERIMENT, 1967, oil and acrylic on canvas, 37 1/2 x 27 1/2". “The Boston Visionary Cell,” an exhibition named after the artist guild that Paul Laffoley founded in 1971 in Boston with several poets, filmmakers, and engineers, unfolds through two indistinct interpretive lenses: Laffoley as theorist and Laffoley as painter. Ultimately he resides in the art-historical canon as a “visionary artist”––a position in the dodgy omnibus “outsider” category that relegates too many artists to the margins––and his prophetic theories about the advent of medical nanotechnology are not only still relevant but have widely proved to be true. While a small portion of this show features archival documents, the subjects of the sixteen paintings and five collages on board here are as manifold and labyrinthine as the man himself. Thankfully, Laffoley––who was also an architect, philosopher, mystic, alchemist, and alien abductee––includes footnotes embedded in vinyl lettering at the bottom of his works that cite the source material for his compositions. Six-foot-tall canvases replete with logorrheic vinyl text spur the viewer to engage with Laffoley’s esoterica––be it Goethe’s organic Urpflanze or the Archimedean spiral. The House of the Self, 1971, a quasi-scientifically rendered proof of Vedic astrology’s road map for the soul to manifest in a physical body, represents the artist’s bricolage ontology bordered with exquisitely rendered grass. Near the entrance of the gallery is a collection of early paintings, film posters, and a government certificate of incorporation for the Boston Visionary Cell. It is here that Laffoley diverts from his obsessive “outsider” horror vacui paintings with compositional restraint in RELATION BETWEEN ELECTRICITY AND MAGNETISM BY AMPÈRE: AN EXPERIMENT, 1967. His warm ocher and yellow oil and acrylic brushstrokes are more Hilma af Klint than Henry Darger as they emanate outward to form a diagram of an early electrodynamics experiment. There is simply not enough time to conceive or follow the totality of logic in Laffoley’s dense body of work—but then again, my conception of time may be more limited than his.